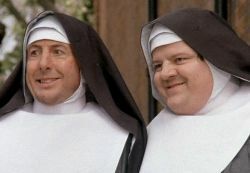 In a parody post once on women’s ordination I had quipped how unfair it was that men can’t become nuns. Well there goes another avenue of parody as it become reality. When you drop Apostolic Tradition, Scripture, and frankly plain common sense you get the Anglican Communion. The vote for women bishop’s was inevitable after women priests since once you theological swallowed the first you might as well drink in the rest of the camel. And of course the term Anglican Communion gets even more oxymoronic every day.